pain, bruising, and swelling got worse and that's when the lump appeared too. So I'm worried that by not wearing the shoe or the crutches all the time has caused more damage. Should I call my primary care doctor in the morning and get in to see him before the weekend gets here, or wait over the weekend to see if it gets any worse? I attached a photo, but you can't see anything very clearly. I made an arrow that points to where the lump is. Thank you for your quick response! At the very least this problem is beyond the scope of your primary care doctor. Your better move would be to see a podiatrist or an orthopedist as they are better equipped to handle any issues that may have developed. There is certainly the possibility that you did further damage when you tripped. The only way to know for sure would be to have another x-ray. Assuming, for the moment, that you did not do any further damage,then based on your first x-ray, even if you did fracture the bone, but it did not show up on x-ray, we would call it a non-displaced fracture meaning with immobilization it should heal. The other problem I see from your narrative is that apparently the dressing that was applied was too tight. Typically after trauma to the foot, the foot will swell which is normal. So a dressing applied initially which might be snug, will become too tight once the swelling begins. Since you did trip, I would certainly recommend another x-ray. If there is no further damage or even if a fracture is present but it is non-displaced meaning there is just a crack in the bone, then immobilization and non-weightbearing would be the treatment of choice. 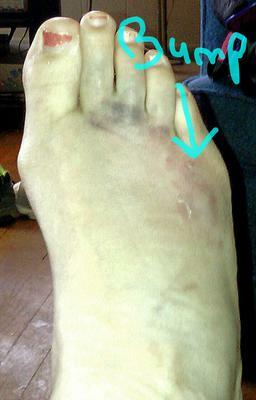 I should also point out that in the type of injury you suffered, dropping a fifteen pound weight on your foot, if there indeed was a fracture it would probably have been a crush injury to the foot meaning if there was a fracture it would show up as a crushed bone rather than just a crack in the bone. My point being, that type of fracture most certainly would have shown up on initial x-ray.